My great friend Don Rives said that generally speaking there isn’t a mutually experienced horizon, only the horizon that we are currently taking in. Metaphorically and literally I find this notion fun to noodle. For years, my colleague and bride Nancy and I have endeavored to broaden our horizons by traveling to visit restaurants and hotels beyond our normal environs so we can expand our frame of reference (FOR) and bring home inspiration for everything from design to recipes. (Many of our QW colleagues do this same thing.) As a bonus, we almost always end up with some high-octane mojo. (BTW: We avoid copying. That ain’t fun or exciting or inspiring … it fails to stir the soul.) We’ve gotten great outcomes from this in the past, so now we are “dancing with the one that brung us” by expanding the program. We recently added a FOR and professional development budget for all QW leadership team members (100+ people) so that they can have even more opportunities to wander about, grow and bring home ideas and energy. A few times a year I lead a small group of my colleagues on a tour of our places. I share the various inspirations for designs, graphics, recipes and so forth. The vast majority of the inspirations come from our colleagues’ and our own FOR adventures. Most of the rest come from reading or other sorts of research … and always through collaboration. What’s more fun than collaboration? Or harder? New Year’s Eve al fresco in Rome! Recently I was asked how many hotels and restaurants we’ve visited in our FOR adventures. 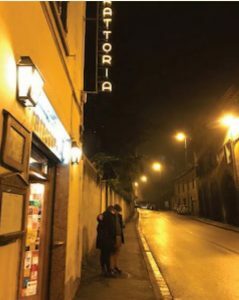 In Europe, I reckon that over the past 12 years or so we’ve checked out or had a bite in around 900 restaurants and dined in more than 250 … and we’ve wandered around at least 350 hotels and stayed in 80-plus (more if you add in the U.S. and Canada). We love getting around, expanding our frame of reference as our entrée and having fun for dessert!! (Oftentimes it is a really big dessert!!) Really, all of it is fun … and rewarding! One day I ought to add up the number of voice notes and photos we’ve shared with our colleagues when we play “show and tell” about our FOR adventures: There’s been a ton! Our guests have benefited as much, probably more, from our colleagues’ FOR adventures than our own. For instance, Leigh Hesling, the Chef for GVG and PWB, just got back from a conference and FOR romp through London … and while I’m writing this, I’m getting text messages from Jeff Kennedy, GM of QW Craft Guild, spouting off about how much he is learning from and enjoying Les Halles Paul Bocuse in Lyon, France. The shower will be about 30% larger without expanding the room or cramping it. It’s magic. Of course, we are using our favorite shower head and hand-held wand. A carefully placed ledge in the shower will help with the leg-shaving game. The soaking tub is being set into a wonderful alcove and modified so that it is even more inviting and easier to get into and out of with extraordinary lighting. Too many details to list here; however, in aggregate … Wow! QW Design Team-designed carpets and embossed wall coverings, plus more than a few surprises! I think folk will say, “I like this place even more, but I couldn’t tell you exactly what has changed. Everything looks like it was a part of this place from the get-go.” We are also having a blast playing with some recipes that are influenced by what we and other members of this team experienced wandering about on our FOR travels. Thinking about the inspirations for these improvements has me recollecting some of Nancy’s and my most memorable recent FOR experiences; below are of some of our favorites. BTW: We dined and stayed at plenty of fancy places, but it isn’t the avant garde culinary treats or architectural marvels that seem to leave lasting memories. We find that what we respond most favorably to in other places is what we aim to give our guests at our places—competence, friendliness and a difficult-to-quantify yet palpable level of sincerity and authenticity (with a dash of playfulness, of course). We end up with those sorts of impressions at places where the staff members, from the kitchen to the front of the house, seem like they are having fun and want to be there … and they seem to naturally look at their guests as people, not dollar signs. Interestingly, not one real expensive place made this “favorite memories” list. This past winter break NKQ, rising college juniors Kathleen and New Dennis, and I met up in France, then journeyed on by rail to Switzerland and Italy. We had a blast! 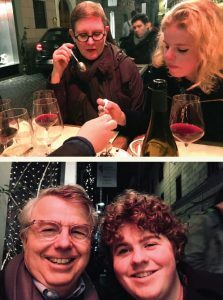 In Rome, we loved Enoteca Corsi, a cozy neighborhood wine shop/restaurant that is only open for dinner a couple of nights a week. It isn’t at all fancy or spendy. The food is great, and the staff is surprised to have guests who don’t speak Italian: Our kind of place! La Buvette is a charming tee-tiny place on a smaller street, where they treated us like family and the food was creative and competent. Roscioli is a foxy, high-end salumeria with a small restaurant. Nearby, they have a great coffee bar and separate bakery. We spent two nights at Mama’s Home, a teeny family-run inn/hotel that ought to give lessons. (BTW: The grooved mirrors for O.Henry’s bathing rooms that I mentioned earlier were inspired by their mirrors.) In Florence, Trattoria Ruggero is a little bit out of the way, yet it’s an extraordinarily capable workaday place with few tourists. La Giostra is the sort of place that you don’t think you’ll like, with celebrity photos everywhere and a garish chef/owner wandering about … but then the magic happens. Our Greensboro friends Massimo and Rodney (Massimo is from Florence) took us there. Beyond our inaccurate first impressions, we found sincerity, competence and a forward playfulness that didn’t distract. Further north we had a wonderful time at Maison Manesse in Zurich. This place is in but not of Switzerland. A “season your own” Steak Tartare sounds like a joke but was anything but. They used a lot of atypical flavors that worked great, and we were blown away that they competently matched wines with them. We only had a short stay in Paris, but we thoroughly enjoyed dining at a little bistro called Metropolitan. The food was really good and the people charming. They were so focused on our enjoyment that we left without paying and they didn’t notice. We circled back. Last spring we visited the Iberian Peninsula. In Lisbon, we dined at three of Chef José Avillez’s restaurants. Mini Bar is so good it makes you want to slap your mamma. Pizzaria Lisboa was a real treat even for my gluten-intolerant best buddy, and Pitaria was a delight. Our friend Filipe Rocha, whom we met when he led the culinary school in the Azores and is now Founding Partner of Azores Wine Company, took us to Bistro 100 Maneiras: Wig flipped! The Time Out Market food hall is extraordinary. In Madrid, Platea Madrid is an inconceivable place: A humongous failed theater was converted into a multilevel food hall/night club, where three Michelin-star restaurants have hubs … what a blast! Although StreetXO is crazy-loud, there is always a line and it is in a department store—stuff we generally avoid—we are glad we didn’t. The flavor meter was pegged. P.S. Here are some travel notes that I’m hoping you’ll enjoy. The Landmark Trust (landmarktrust.org.uk) is a charitable outfit based in the UK that rescues important buildings that might otherwise be lost … and they rent them out! During the off-season, some of their places can be surprisingly affordable. Over the years we’ve stayed in their restorations in the UK, and this past winter holiday break we took residence in four of their places in France and Italy. Ireland has the Irish Landmark Trust (irishlandmark.com). A few years back Nancy and I spent our annual honeymoon staying in their places. We’ll never forget the experience, and Nancy will never forget my driving. (Note to self: Next time, get an automatic. Wrong side of the road, backward roundabouts and the wrong hand on the gear shift: If you can’t find ‘em, grind ‘em.) Happy Trails! !